If you are injured by an Uber driver, contact our Salt Lake City Uber accident attorneys, at Jardine Law Offices P.C. to help you navigate the murky Uber insurance coverage waters. Rideshare companies like Uber have flooded markets around the country and don’t seem to be slowing down anytime soon. People appreciate the fact that Uber vehicles are often newer and cleaner than cabs and other regulated car services, and that Uber’s app to order a car couldn’t be easier. Even more, there’s no scrounging for cash or waiting for the driver to run your credit card at the end of the ride; it’s all handled through the app. Sure, Uber has all of the above mentioned conveniences, but something you may not think about when you’re stepping into an Uber, and something that the state of Utah has issued a warning about, is that there are unresolved insurance coverage issues when it comes to an accident where an Uber driver is at fault. People often assume that when they get into an Uber, or when they are sharing the same streets with Uber vehicles, they will be covered by Uber’s liability insurance should a car accident happen. Not so fast! Sometimes Uber’s insurance policies cover injured parties and sometimes they don’t. There’s red tape, technicalities, and legal issues that you will likely have to wade through if you are in an accident with an Uber driver. As mentioned above, the State of Utah has warned that there are insurance risks for people who use Uber’s rideshare program, and there are also risks for anyone who happens to drive, walk, or bike on the same streets as Uber vehicles. Normally when an employee causes a car accident while operating in the scope of his/her employment, the injured party is covered by the employer’s liability insurance, but Uber drivers are not employees. 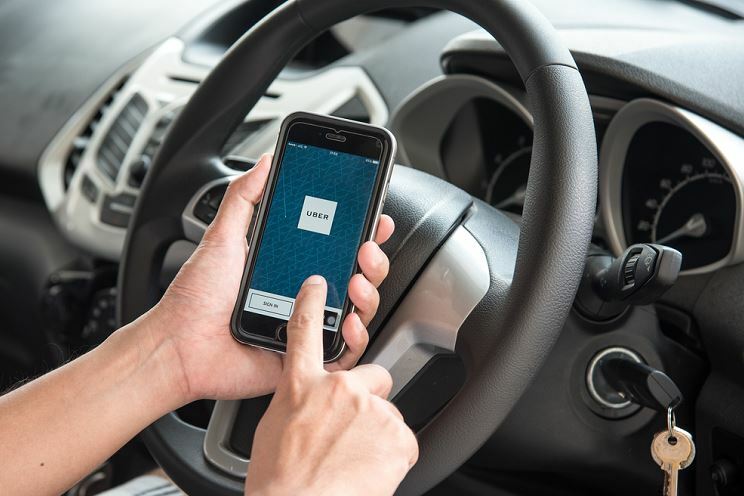 Uber hires drivers as independent contractors and as a result, their insurance policies deny coverage in certain circumstances leaving the injured party to fight it out between Uber and its drivers’ insurance companies. Is the driver’s personal insurance policy in effect at the time of the accident and does it cover the extent of the injuries? Is the driver logged into the Uber app at the time of the accident? Is the driver logged into the Uber app, but not on a job at the time of the accident? Is the driver on a job at the time of the accident? An injured party is most likely to find insurance coverage through Uber if the at fault driver is on a job (has accepted a pickup and is in the process of transporting passengers to their destination) at the time of the accident. When an Uber driver is at fault, Uber’s policy has been to cover the injured party when its drivers are on a job and only if the driver’s personal insurance policy is not enough to cover the extent of the injuries. In essence, Uber’s policy is gap coverage, but often the driver’s personal insurance policy is not in effect when the driver is working “for profit” which means that the injured party has to look back to Uber’s insurance policy coverage. And if all of that isn’t sticky enough, there isn’t a lot of state law or case precedent to define whether and whose insurance is in effect in what circumstances. What happens if Uber denies coverage because its driver wasn’t on a job and the driver’s personal insurance policy denies coverage due to a finding that the driver was working for profit because he/she was logged into the app, even though not currently on a job? As you can see, car accident injuries involving an at-fault Uber driver can be extremely difficult for the injured party. For these reasons, if you are injured by an Uber driver, contact our Salt Lake City Uber accident attorneys, at Jardine Law Offices P.C. to help you navigate the murky Uber insurance coverage waters.